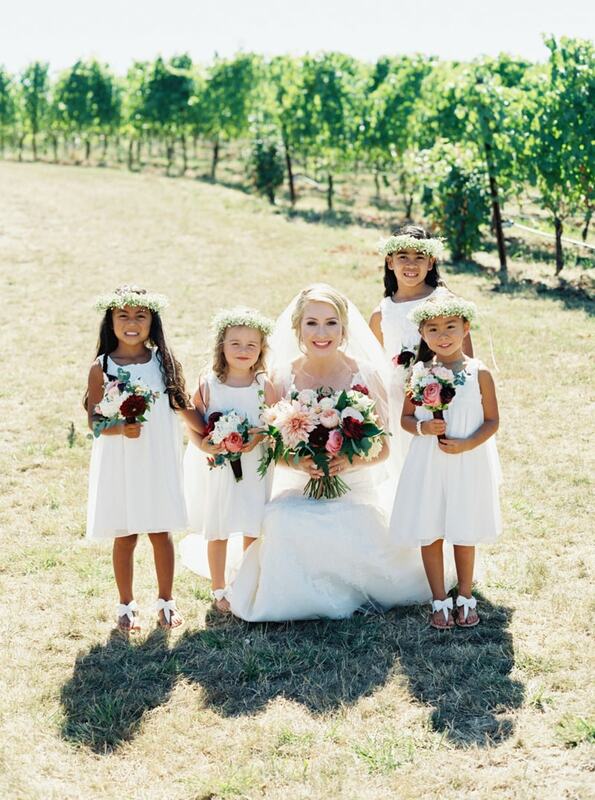 Zenith Vineyard Oregon Wedding. 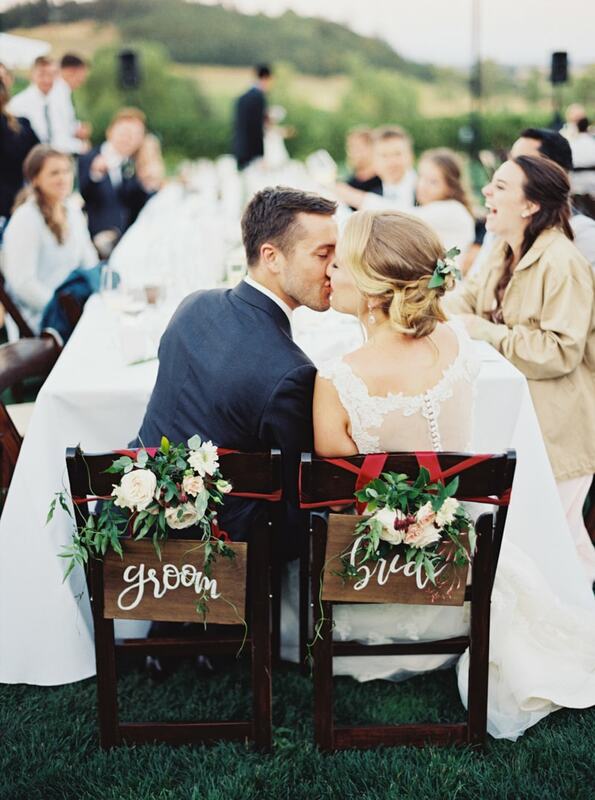 As soon as they got engaged, Zoe and CJ knew that their wedding had to be an intimate outdoor affair, filled with romance and classic, elegant style. 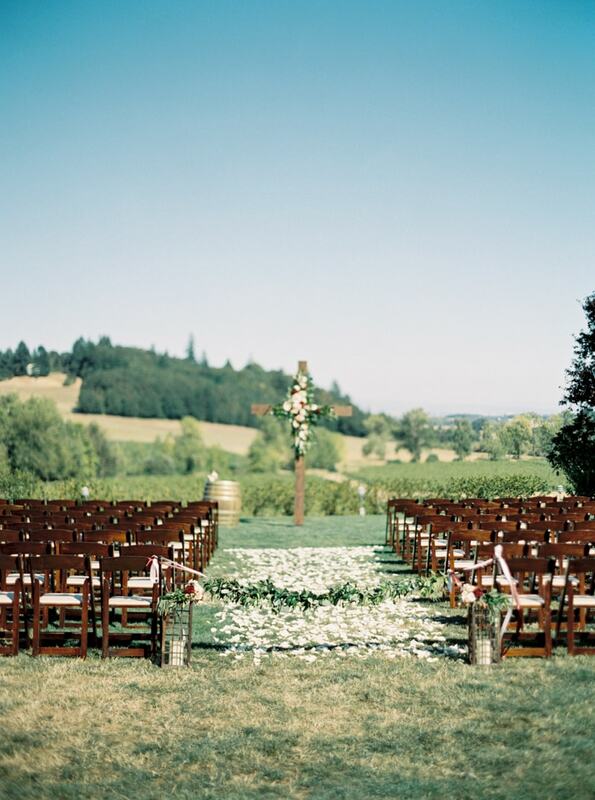 They got that and much more at Zenith Vineyard in Salem, Ore. And, although their day was stunning and sentimental, the quality that truly set it over the top was the love they felt from each and every guest. 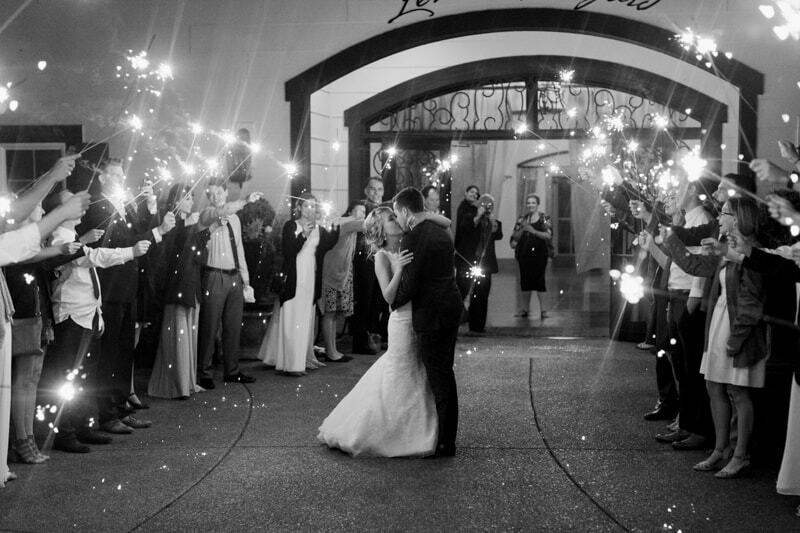 Zoe was a hands-on bride, so seeing the finished product of her hard work certainly paid off. All of the details, from the timeless invitation suite to her embellished sandals were well thought out. The bride and her bridesmaids all got ready in matching floral robes. Zoe was calm and collected as she took in the sunny morning and put on her cherished gown. She chose a classic lace V-neck gown that looked like it was made just for her and capped off her wedding day look with a long veil. CJ was a handsome groom in a dark gray suit with a black tie who couldn’t wait to see his bride. 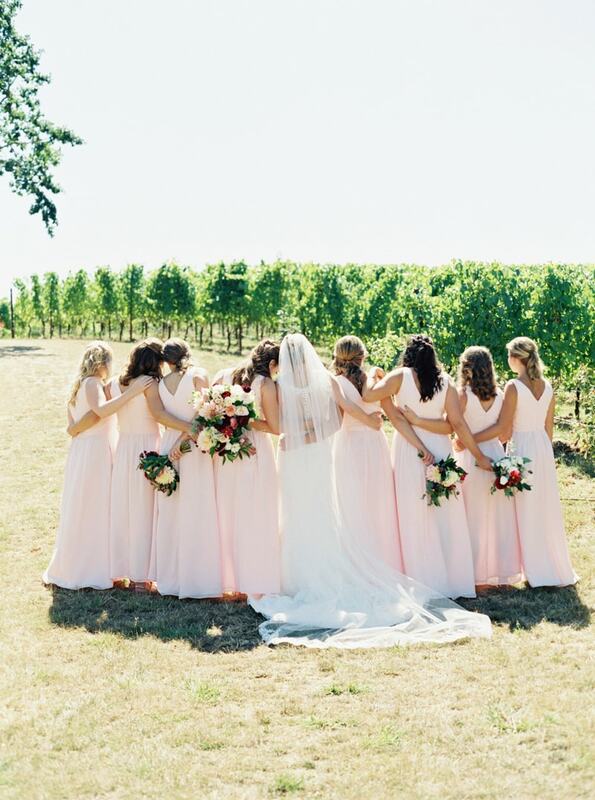 The couple planned a first look moment before the ceremony right in the heart of the vineyard. CJ took one look at Zoe and beamed. 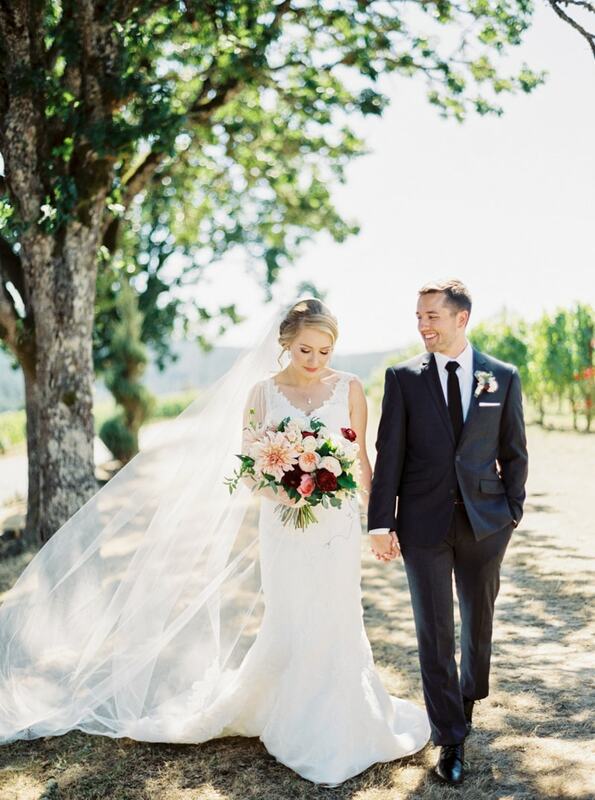 The couple took the opportunity to also take photos together before the ceremony, which showed Zoe looking marvelous with her white, blush and wine-inspired bouquet. Of course, they made a stunning pair underneath the trees, basking in the bright Oregon sunlight. 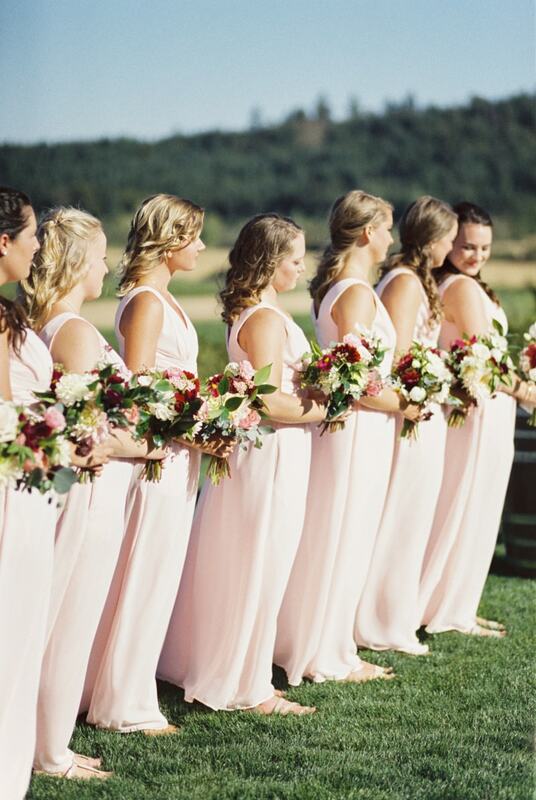 Zoe’s bridesmaids all wore long V-neck blush gowns and carried flowers they all picked themselves just days before the ceremony. 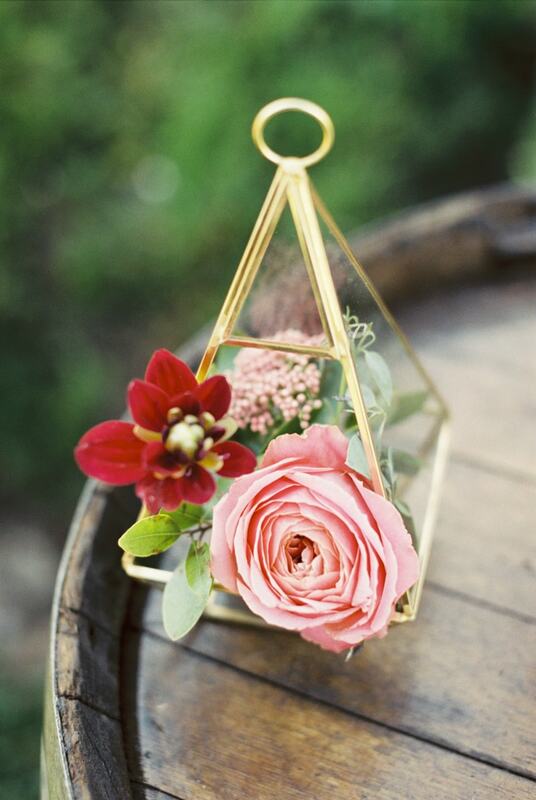 The bride’s florist used the flowers to create the stunning bouquets the ladies carried on the big day. Just like CJ, all the groomsmen matched in dark gray suits and black ties. Their flower girls also played a special role. They are the daughters of Zoe’s cousins, who happened to be the flower girls in her parent’s wedding 31 years prior. 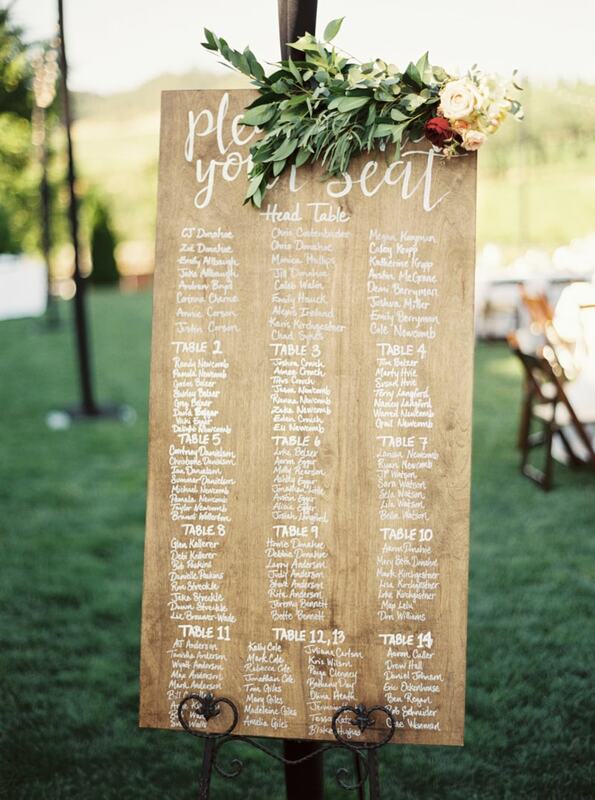 Guests were greeted at the ceremony by a handwritten sign. 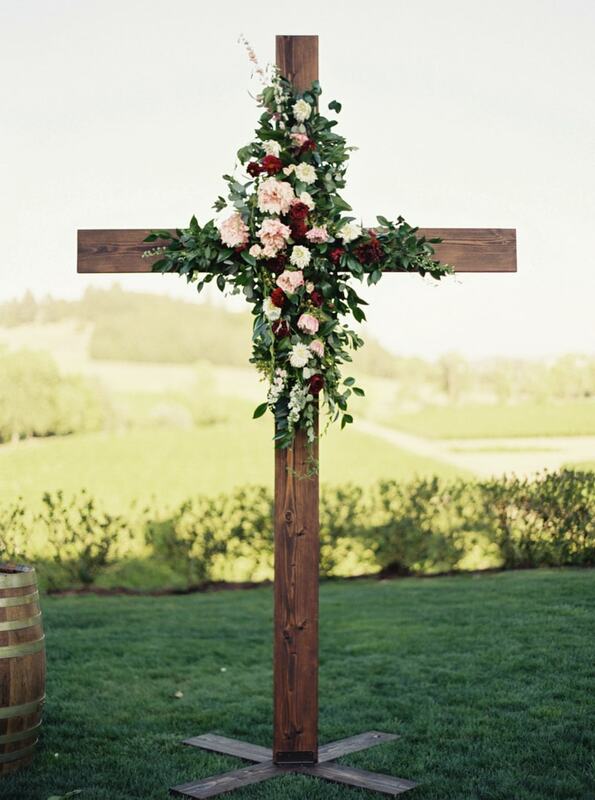 The dark wooden chairs were neatly placed row by row in front of a stunning 10-foot wooden cross made by the bride’s father. The ceremony was the couple’s favorite part of the day. The bride’s father walked her down the aisle and performed the ceremony. 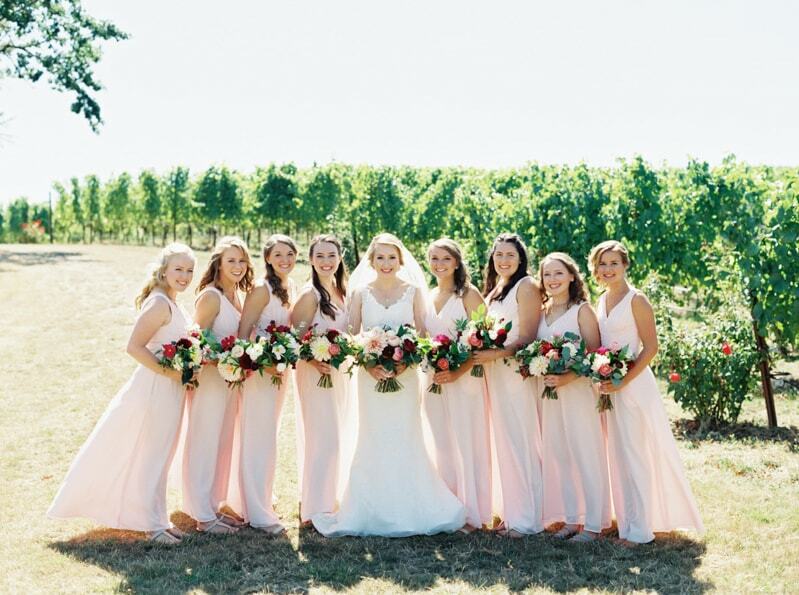 Their mothers watched lovingly from the audience, CJ’s father began the ceremony with a prayer, and all of the couple’s siblings served in the bridal party. After the ceremony, Zoe removed her veil and went searching for fun in the vineyard with her brand new husband. The outdoor reception was a fun-filled event featuring elegant florals and classic lawn games for guests to enjoy. A special memory table, a handwritten seating chart and loads of flowers were just a few of the touches Zoe incorporated into the reception. 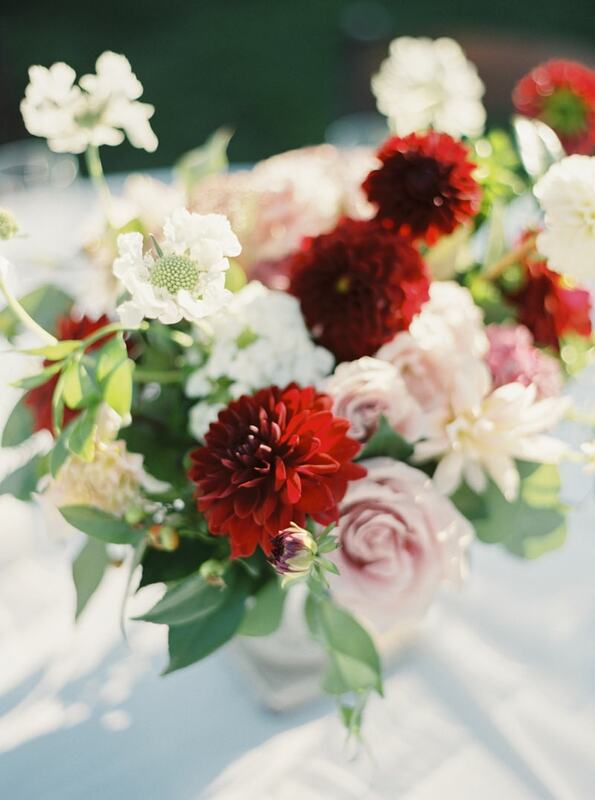 Tables featured white linens, fresh greenery and colorful floral centerpieces. Elegant place cards and menu cards greeted each guest as they found their seat. 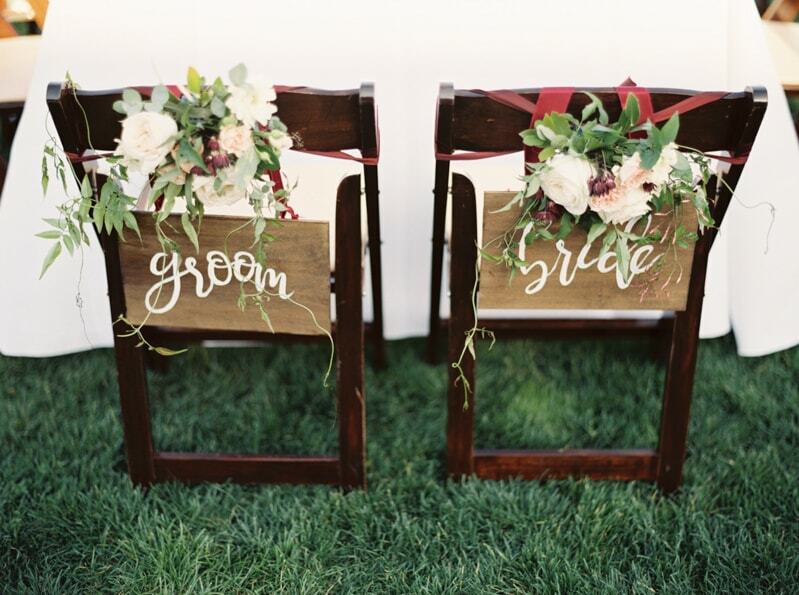 The couple’s seats at the head table were marked off with beautiful “bride” and “groom” signs adorned with fresh flowers. They toasted one another and got the celebration off to a wonderful start. Their cake was a simple creation that featured three white tiers covered in buttercream and topped with the fresh addition of the same colorful flowers seen throughout the day. As day turned to night and the sky showed off its myriad of colors, the glow of bistro lights became more prominent. Guests dined and danced well into the night as they celebrated this fantastic, much-loved couple. Zoe and CJ made sure that their day was not just a celebration of them but also of all the people who have filled their lives with much joy and love. The feeling of being surrounded by their loved ones on their wedding day was something they’d hoped for, and was the one detail that made it truly perfect.